I was wondering if it is possible to have a custom bitmap when using two columns with smoked glass skin ? Hi Jcee and thanks for your kind help ! I used " resoruce hacker" instead of reshacker , was that the reason it doesn't display correctly ? Could you solve that issue Jcee and tell what happened ( I'd like to understand to do myself further changes with other custom backgrounds ) ? so I don't know why it does that compare to your skin ? This will override the default setting (fullglass), and the option 'increase transparency' as it is defined later in the file. Main_opacity can be solid, region, alpha, glass, fullalpha or fullglass. Solid means the menu will be filled with the Main_background color and the bitmap will be drawn on top. Region means the pixels with alpha=0 will be transparent, and the rest will be opaque. 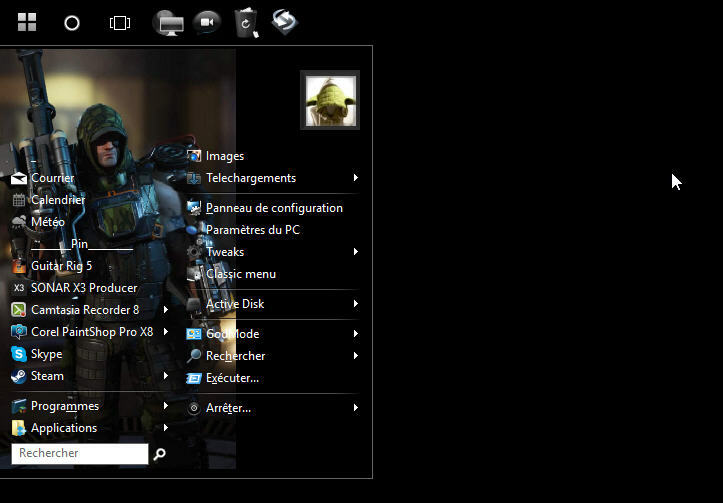 Alpha means that the bitmap will be alpha-blended with the desktop behind it. Glass means the pixels with alpha=0 will be transparent, all the rest will blend between the glass color and the pixel color (alpha=1 is full glass, alpha=255 is fully opaque). 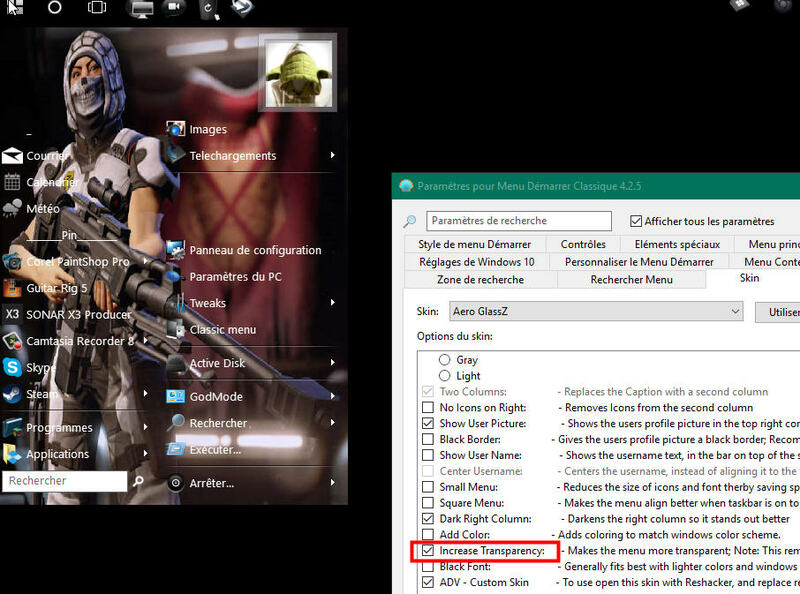 Fullalpha and fullglass are the same as alpha/glass but inform the start menu that the background behind the menu items can be transparent. Thing I don't get is why all is working with yours and fullglass enabled ? anyway thank you again ! I am only guessing, like Jcee, 9 times out of 10, problems are usually because the main bitmap used is 24 bit, instead of 32 bit. If you want transparent bitmap, alter the alpha value 255 to lower, say 200. I just did an experiment. I copied your "imgur" picture, downloaded Jcee's skin. Did not change any text. Made imgur picture 24 bit= menu flashes and goes away. Made imgur picture 32 bit=works ok. I believe that is the problem/solution. Went into Image, properties. Selected 32 bit target. Thanks for all advices Jupiner! have a merry Christmas all ! 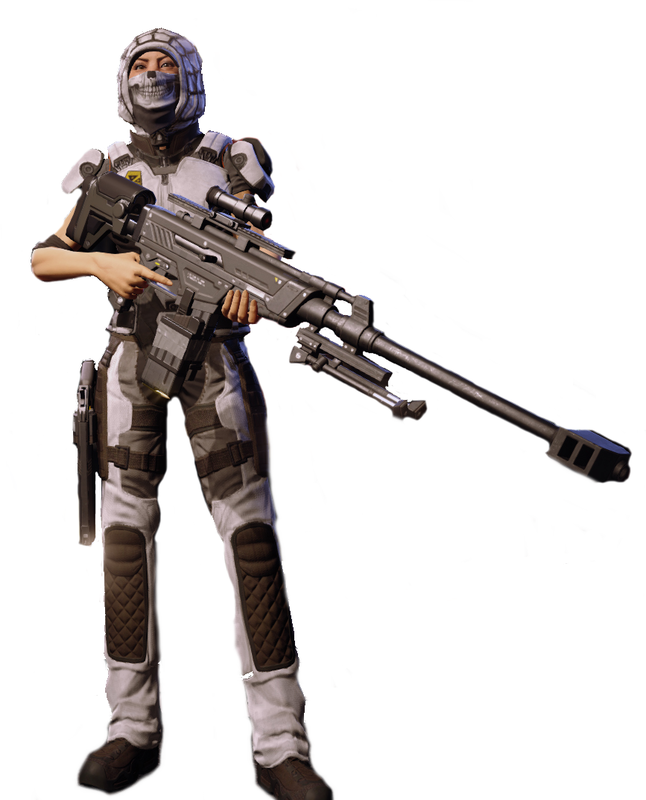 You have a good eye for the best members in XCOM2. Now I like the big powerful grenadier man, that you used. I put him in the skin as well. Gave them all a fuzzy background. I have put the skin in the old BatDude post, if interested. is there any way to decrease it with classic shell settings ?? I keep getting stream write errors and can't change anything.